Hi all! 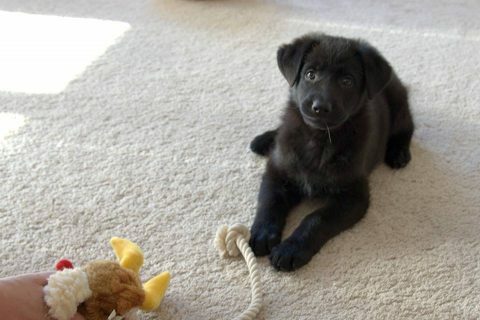 Today I’m up on Pens, Paws, and Claws, talking about fictional German shepherd Bella and the real-life pup who inspired her. This entry was posted in dog books, dogs, Downward Dog Mysteries on October 29, 2018 by Tracy Weber. Thanks to all of you who continue to follow my blog and other writings. The rest of this year is going to be crazy-busy for me, as I start my new adventure learning to work in animal behavior. Along with my “real” job teaching yoga and running yoga teacher trainings, I’ll be heads down in final edits for my next Downward Dog Mystery, which is now available for pre-order and will release on January 8! Add to that attending the Northwest School of Canine Studies and pursuing a Certificate in Applied Animal Behavior at the University of Washington, and I will be a busy lady. I’ll still post updates and news on the blog, but not weekly. If you have specific topics you’d like me to consider writing about, please let me know at Tracy@TracyWeber.net or in a comment on this article. Otherwise, Ana and I will still be on Facebook, and we hope to see you there! Have a lovely fall, everyone! This entry was posted in dog books, dogs, Downward Dog Mysteries, writing on September 18, 2018 by Tracy Weber. Today is Ana’s second birthday! I could never have predicted the joy, frustration, and chaos this sweet soul would bring into my life, but I wouldn’t change a thing! 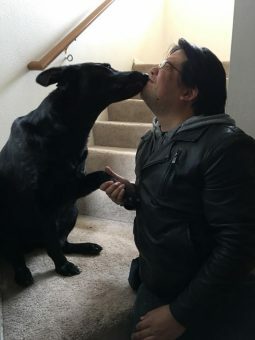 Please help me celebrate my second soul dog with the photos below of our time together — so far! I fell in love with this little sweetheart from the first photo I saw of her. 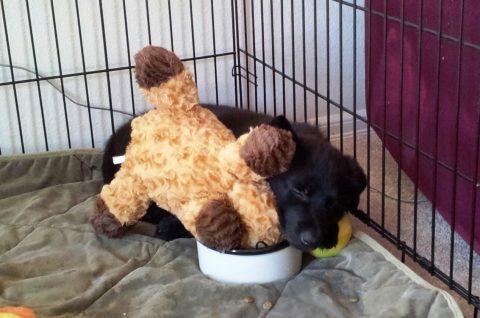 She was a little over 4 weeks old at the time. A week and a half later, I flew to California, and we met for the first time. Ana looked much cuter than I did. I named her Ana, short for Ananda, which means unending joy. I failed to consider what that might look like through the eyes of a puppy. A week after that, hubby and I drove back to Sacramento pick her up. We had NO IDEA what we’d gotten ourselves into. Her true personality emerged within a week. 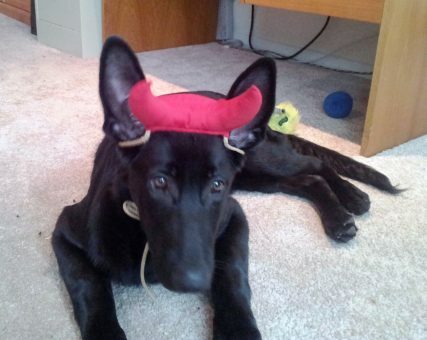 Hence, her first Halloween costume. 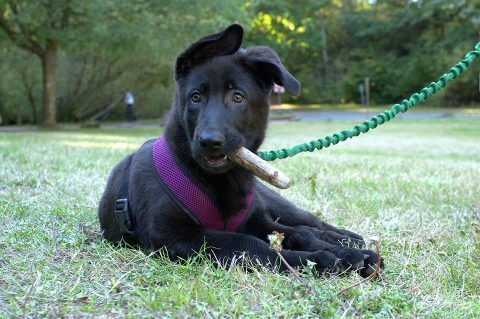 She soon developed an obsession with sticks. Which so far, she hasn’t outgrown. Our first real challenge was figuring out how to contain her. 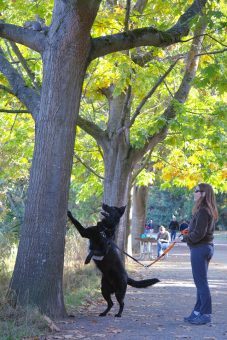 She could slip every harness, jump on the kitchen counters, and scale 5-foot fences by the time she was 5 months old. 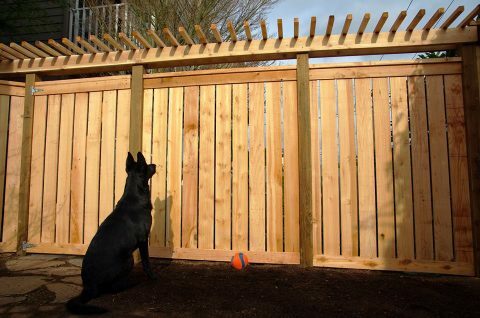 We finally figured out a fence that could contain her. You can’t see the cement moat we poured underneath it. Here she is, strategizing how to get out the day it was installed. She was 6 months old at the time. 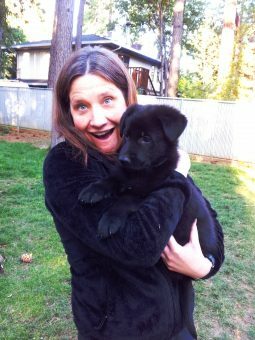 As she grew older, a vet finally figured out that her hyperactivity was due to food allergies, and I started the long process of rebuilding her health. We still struggle, but there are many more good days than bad. She finally grew in to those ridiculous ears. And her teeth grew in to her. 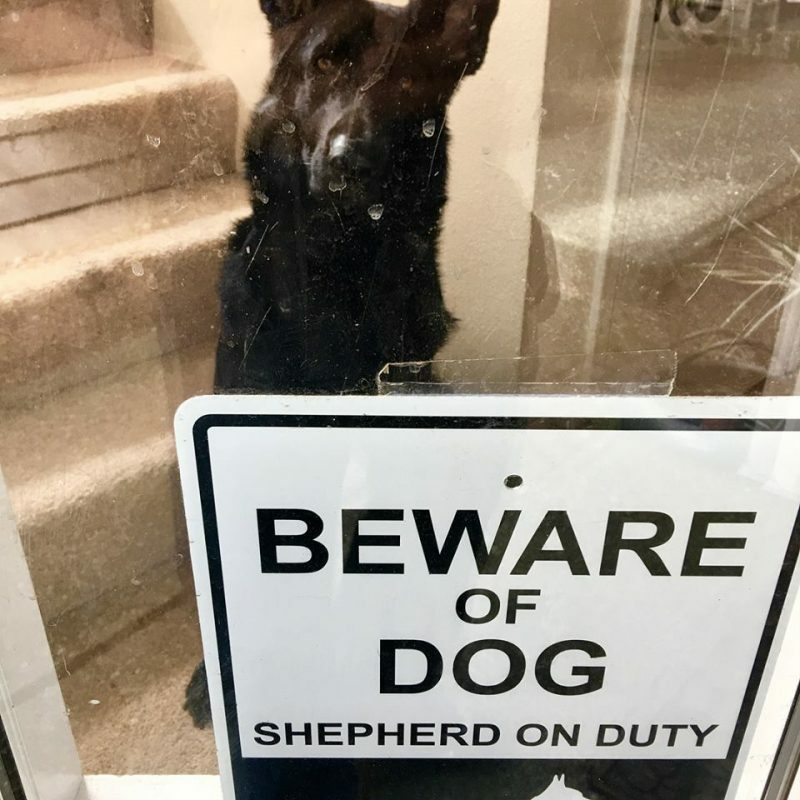 She rejected her job as guard dog. Making it clear that she was a lover instead. Unless you’re a squirrel, that is. Ana and I have become best friends. We’re never far apart for long, but when we are, it is always a joyous reunion. I can’t imagine my life without this girl, and frankly, I don’t want to. Here’s hoping we have at least another decade of birthdays to come! Happy birthday, little sweetheart! I adore you! 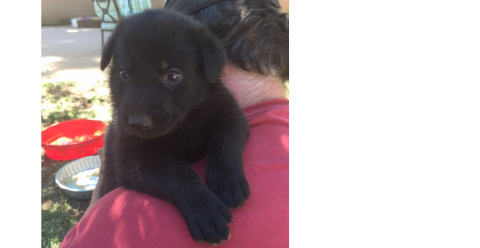 This entry was posted in dogs, Gratitude on June 25, 2018 by Tracy Weber. Happy Holidays and a #Giveaway! Hi everyone and Happy Holidays! I’m taking a week off from writing a new Whole Life Blog article, but that doesn’t mean I’m silent. I’m blogging this week at Killer Characters, a group blog for mystery writers. 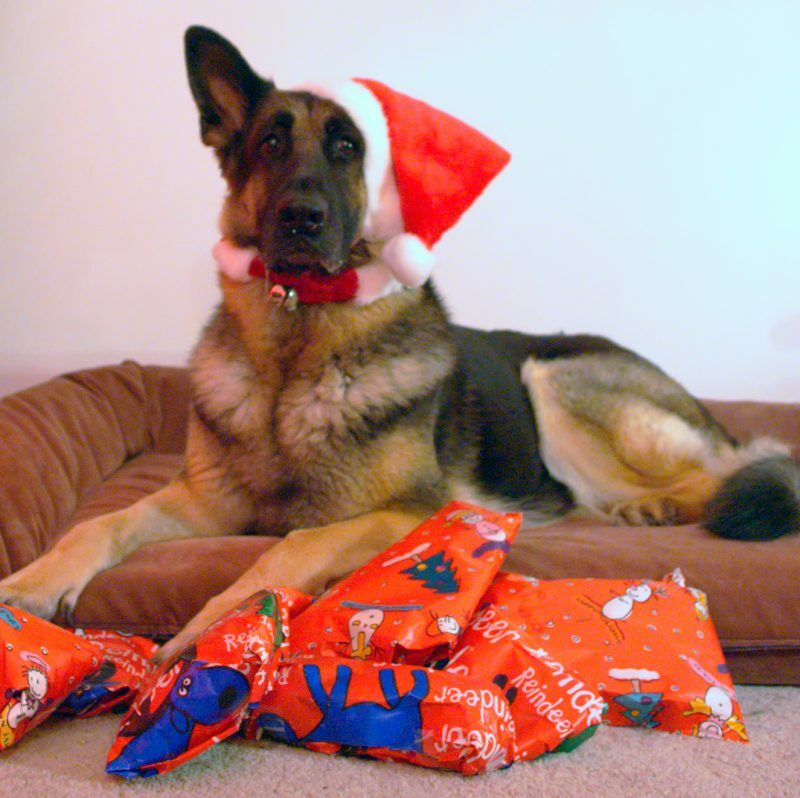 This week Bella, the German shepherd in my series, is talking about Christmas in Seattle and giving away a copy of the fourth book in my series, A Fatal Twist. 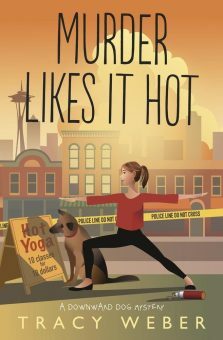 Mention your sincere holiday wish on the Killer Characters blog, and you’ll be entered to win a copy of my fourth Downward Dog Mystery, A Fatal Twist! Check out the article at the link below, and good luck! 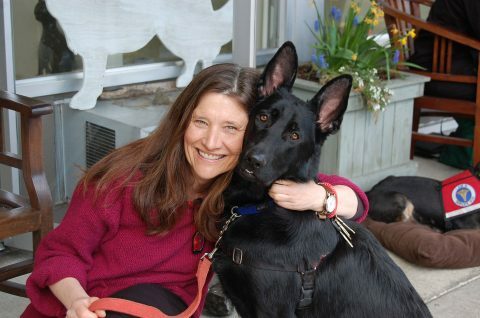 Tracy Weber and her sidekick, crazy Pup Ana! All four current books in the Downward Dog Mystery Series are available at booksellers everywhere! This entry was posted in dog books, dogs, Downward Dog Mysteries, writing on December 11, 2017 by Tracy Weber. Happy Fall from Kate, Bella, Tracy, and Ana at Green Lake! Hi everyone and happy fall! I’m taking a week off from writing a new Whole Life Blog article, but that doesn’t mean I’m silent. I’m blogging this week at Killer Characters, a group blog for mystery writers. You Seattleites might appreciate all of the fall photos of Green Lake. Everyone might want to check it out for a contest! 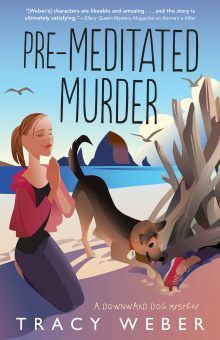 Mention your favorite fall location on the Killer Characters blog, and you’ll be entered to win an advanced copy of my next Downward Dog Mystery, Pre-Meditated Murder! Check out the article at the link below, and good luck! This entry was posted in dog books, dogs, Downward Dog Mysteries on November 13, 2017 by Tracy Weber. When the truth will cause harm, say nothing. I was reminded of that on my walk with Ana Pup last Tuesday. 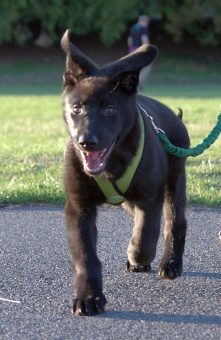 I wasn’t on Facebook when my German Shepherd Tasha was young. I didn’t have a blog or a mystery series at that time, either. So very few people, other than my yoga teacher training students, know about her first years. When Tasha turned a little over a year, she started losing weight. I took her to multiple vets, none of whom could find figure out why she was ill, much less how to help her. Experimental surgeries were recommended. I stayed awake nights worrying about her. I prayed that if she were suffering, God would take her from me. I didn’t want to send her to her next life too soon, but I didn’t want to allow her to suffer in this one, either. In spite of the weight loss, Tasha loved our daily walks, and I couldn’t take them away from her. 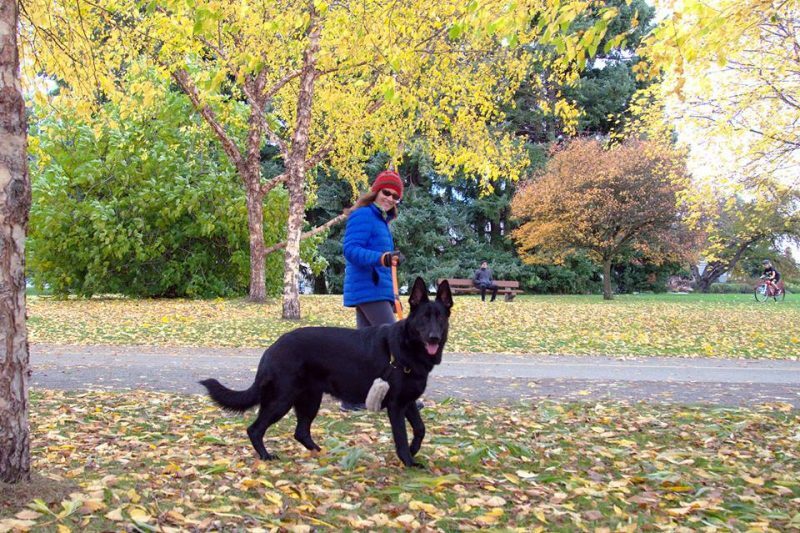 I walked her around our neighborhood sometimes, but mostly she and I strolled around Green Lake. In those final few weeks before diagnosis, Tasha’s ribs started showing, and she needed to rest frequently. She’d lost twenty-five pounds, and she looked it. People stared at Tasha and made assumptions about me, none of them good. 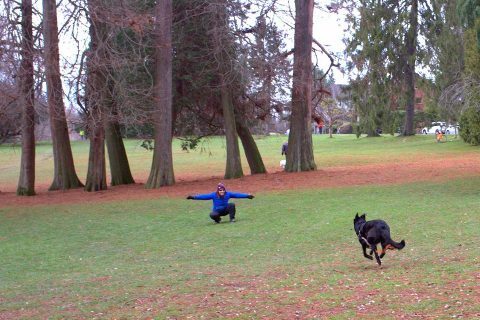 I never understood why people believed a woman who was purposefully starving her dog would walk her around Green Lake, but think that, they did. People stopped me multiple times each walk. Some firmly told me that my dog was too skinny, as if I’d been too oblivious to notice. Others asserted that I obviously wasn’t feeding her or that I was feeding her garbage. Still others angrily threatened to call the Humane Society. I explained over and over and over again that I wasn’t abusing my dog, but many of them never believed me. Still, the walks were important to Tasha, so we kept walking. Finally one day, a kind man stopped to tell me that my dog was gorgeous. While we were talking he jokingly asked, “Is she working on being a supermodel?” I knew he was hinting at her weight, but the way that he said it was so much kinder than anyone else. So I told him that she was sick, that we hadn’t found a diagnosis yet, and that I was afraid I would lose her. He then told me that his dog, the gorgeous husky that was walking next to him, had almost starved to death too, and that he had worked with a wonderful vet who had diagnosed his dog’s issue when no other vet could. He gave me her name, and I called her the instant I got home. That’s how I met the wonderful doctors Marta Norbrega and Jackie Sehn at Mercy Vet. I will always be grateful to this man, though I never saw him again. 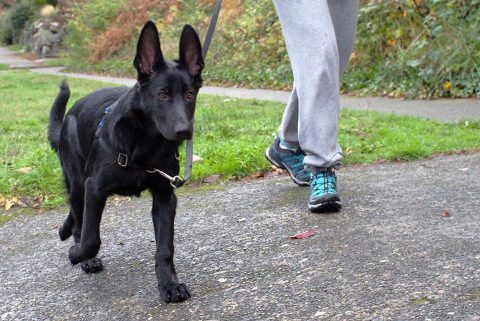 He and the vets at Mercy Vet saved Tasha’s life. Once we got a diagnosis, (Exocrine Pancreatic Insufficiency) we immediately started treatment, but the path to weight gain for Tasha was slow. The comments about how I was obviously abusing her continued. My vet even offered to write a letter that I could show to the strangers who accosted me. My experience wasn’t unique. 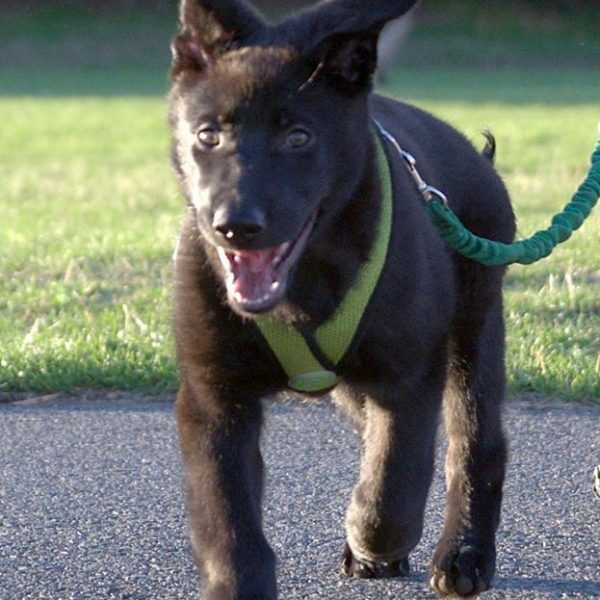 Other owners of dogs with EPI face similar challenges. I know some who don’t walk their dogs in public at all anymore. Some dress them in T-shirts. Some do what Jackie recommended and carry signed notes from their veterinarians. All because people are so ready to make assumptions. Our society has become mean. We don’t ask questions, we make judgments. I find that tragic. Over twelve years later, I was reminded of my experience when I spoke with a man walking a tiny poodle mix wearing bright yellow dog boots. He volunteered to me that his dog has severe allergies to grass, and without the boots she becomes lame. I congratulated him on how well he had trained her, and he told me that she was his medic alert dog. I don’t know everything the dog does for him, but one of her jobs is to wake him up at night when he stops breathing. This dog keeps him alive. To say that he loves her and takes excellent care of her would be an understatement. At the end of our conversation, he sighed and said that on his way home, he would have to talk to the “Phinney People.” I didn’t know what he was referring to at first, but he explained that he meant people on Phinney Avenue North, a busy thoroughfare a block away from where we were speaking. My heart broke for this man. He’s doing the best that he can, with love, with the resources available to him. And yet rather than ask questions, people choose to judge him. Which brings me back to the yoga teachings. We see the world through filters, which are often darker than reality. We make attributions about others’ motivations. We judge people, often harshly. Yoga is about clarifying our filters. Yoga is about learning to be kinder. Yoga teaches us that the only people we’re meant to change are ourselves. When it comes to communications, I think these teachings have great applicability to our society today. As the teachings assert, sometimes the most important thing we can say is nothing. PS: If you’re interested in learning more about Whole Life Yoga’s Teacher Training Program, you can check it out at this link. This entry was posted in dogs, Yoga Philosophy on October 30, 2017 by Tracy Weber. Happy Labor Day, everyone! As promised last week, below are some photos of Marc, Ana’s and my recent trip to Cannon Beach, Oregon. The trip was doubly special because we both got to see the full eclipse and spend some time at the location of my upcoming mystery, Pre-Meditated Murder! We got into town early enough to settle in to our tiny beach house and do an early romp on the beach. Ana inaugurated the beach with her first paw print. 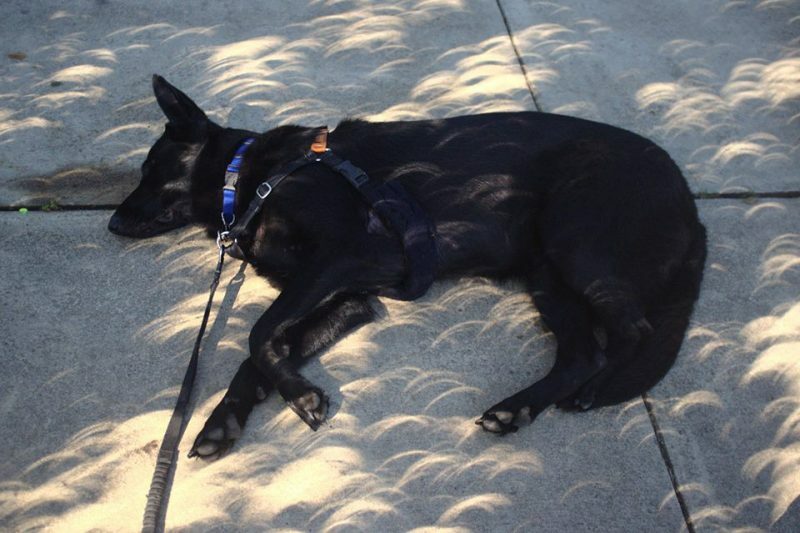 Then we rested up to leave at six the next morning to drive to the path of totality. Ana practiced wearing her eclipse glasses. Still, totality was pretty amazing, at least for us humans. We made it up to Ana by taking her to the beach and letting her run. 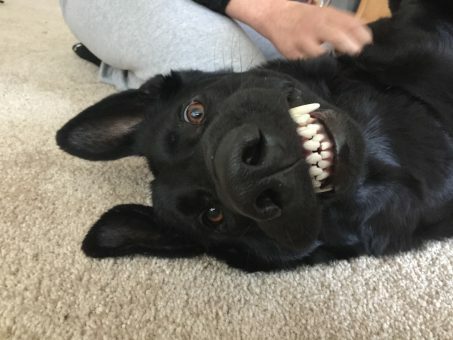 She was a very happy girl. And got a little exercise themselves. 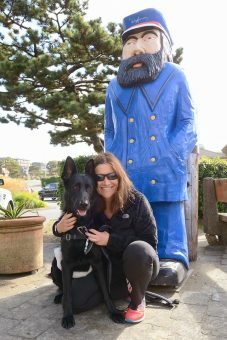 We even visited our favorite sailor statue. Alas, it was finally time to say goodbye. But we had a fabulous surprise shortly after we returned home! We’re already planning our next trip to this very special place. In the meantime, I’ll share it with you this January in Pre-Meditated Murder! Hope you all had a wonderful summer filled with love, laughter, and vacation adventures. This entry was posted in dog books, dogs, Downward Dog Mysteries, Gratitude, writing and tagged Cannon Beach on September 4, 2017 by Tracy Weber. We had such a great time (as always) at VegFest this year that I wanted to share some photos with you. Enjoy, and come see us there next year! I started the first day staffing the booth with the fabulous Katie West. Here we are, before sixteen hours of crowd surfing stole all of my beauty. Soon the masses descended, filling the space with people ready for food and fun! Of course no day would be complete without a visit from Ana Pup. I couldn’t convince anyone to let her come inside as my service dog, so we took a break and explored the rest of Seattle Center. 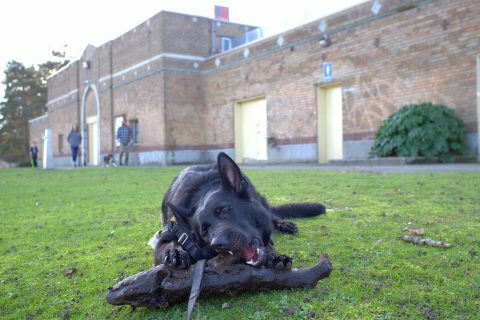 Ana enjoyed playing with her stick. I enjoyed hanging out by the fountain. Then I came back and split my time between talking about my mystery series and chatting with potential new yoga students. By the second day, I was looking a little more weathered, so you’ll have to take my word for it that I was there. The fabulous Rene de los Santos can vouch for me. I finished the day by checking out the goat rescue booth. I will someday soon own goats myself. The husband unit disagrees. After we’d packed up for the weekend, hubby and I went to the season finale of The Walking Dead at the Edmonds Theater. No photos included, as I resembled a few of the cast members too much for my comfort. That’s all for now, but I hope you join us at VegFest next year. It’s always exhausting, lots of fun, and it offers all of the tasty vegetarian treats you can ask for! This entry was posted in dogs and tagged VegFest on April 17, 2017 by Tracy Weber. 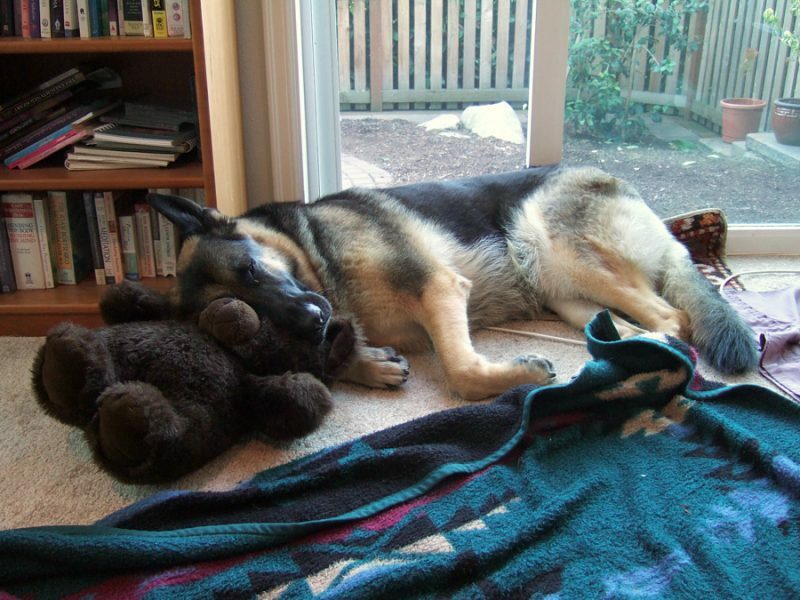 Last week I wrote about the loss of one of the greatest loves of my life, my German shepherd, Tasha, who was the inspiration for my Downward Dog Mystery Series. Specifically, I wrote about how through her bravery, I learned how to love again. Today I’d like to share some of the lessons she taught me. I actually wrote this to Tasha as we lay in bed together on one of her last nights, but I waited to post it until now. Wherever she is, I hope she doesn’t mind my sharing. Tasha Dog–still happy ten days before she passed. There’s a lesson in that, too. As we lay here together, we both know our time left together is short. Being with you now is a privilege, and it reminds me of all of the lessons you’ve taught me over our past twelve years together. I am able to love–and be loved–without condition. I know, it seems like this should be a given, and it probably is. But somehow I needed your presence in my life to prove it to me. This will always be your greatest gift. Love is hard–but so very worth it. I feel sorry for people who experience loss and then give up on love. Nothing is more powerful. Nothing is more worth doing. Over and over and over again. We all make mistakes. Lord knows, I’ve made plenty, especially in your earlier years. Frankly, my sweet, you made some doozies. It never changed my commitment to you, or yours to me. Not once. There’s incredible beauty in that. When you make a friend, you love them for life. You didn’t trust many people, but when you bonded with someone, you did so completely. You never forgot their names, and you recognized them years later. In your last days, those same friends came to see you, some after having not been with you for a very long time. You see, they loved you for life, too. It’s never to late to make new lifelong friends. As you aged, you grew sweeter. Your circle of friends broadened. I met some of the best people in my life in the last two years of yours–and all because of you. In those friendships you live on for me. You can live with chronic illness and pain and be happy. Both of us have imperfect bodies, but you never complained about yours. You accepted it and were happy in spite of it. I’m still working on that one. The mailman is not to be trusted. OK, Sweetie. If you say so. I promise, I’ll keep an eye on him. You can relax now. Your guard dog days are over. You did your job well. I have a few requests for you as you move on to your next journey. Don’t wait for me. I don’t know if there’s a life beyond this one, but if there is, live it. Without regret, without reservation. Enjoy it. Relish it. I will join you when it’s my time. Come get me then, but feel free to forget about me in the meantime. That said, if you want to visit, I’ll be here. Writing about you. Thinking about you. Loving you. I am here for you. Always. I will be OK without you. That doesn’t at all reduce my love for you. In fact, it shows how very strong that love is. You don’t have to worry about me anymore. You made me strong enough to survive on my own. Goodbye Puppy Girl, my sweetheart, my love. Thank you for gifting me with almost twelve years of your presence. I will always love you; always miss you. But I am forever grateful for the gift of you in my life. This entry was posted in dogs, Gratitude on February 13, 2017 by Tracy Weber.